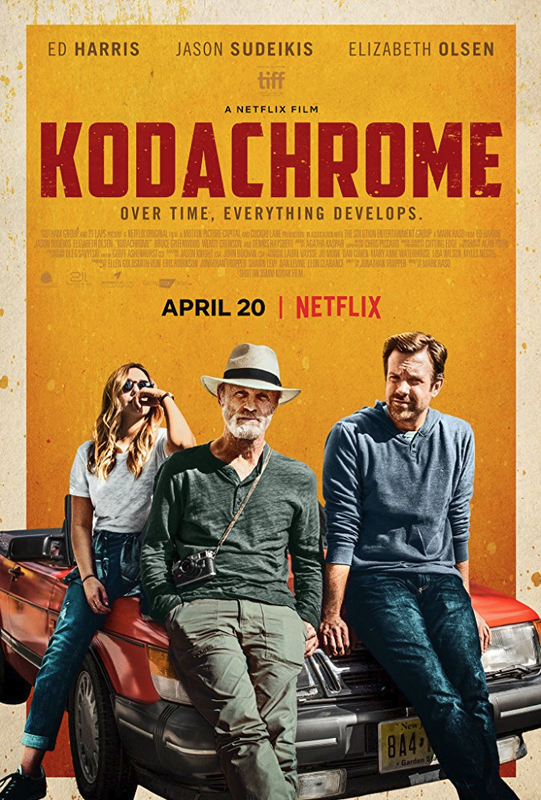 Kodachrome directed by Mark Rosa uses the final days of the film to tell the story of a world-famous photographer (Ed Harris) who is dying from cancer and his estranged relationship with his son ( Jason Sudeikis). Sudeikis is convinced to join Harris and his nurse (Elizabeth Olsen) to travel to a Dwayne's Photo Service in Parsons, Kansas where the last rolls of Kodachrome were processed both in the film and in reality. Harris's photographer has several exposed film rolls that he wants to be processed before he dies. He also sees it as an opportunity to possibly reconcile with a son he hasn't spoken to in a decade. Sudeikis and Olsen are able to hold on their own while on the screen, but it is their moments with Harris that truly bring the film to life. It is ironic that a movie that takes its narrative spark from the end of a revered film emulsion and that was itself shot on Kodak motion picture film is being shown not in a movie theater but is being streamed over Netflix. Nevertheless, the movie demonstrates that despite how things change, there are certain things in life that are immutable and precious.